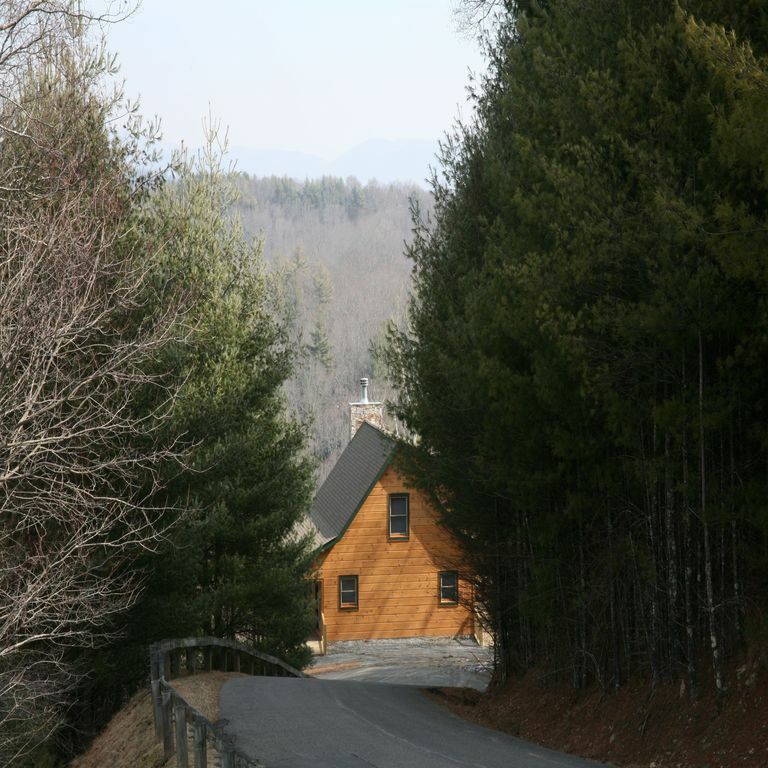 River Perch is the perfect cabin rental for your getaway or vacation. Please make our home your mountain home away from home. We purchased River Perch cabin as our personal vacation home in the Blue Ridge Mountains. We named our home River Perch because the cabin literally sits perched atop the mountain side offering beautiful views of the river and mountains. It is our peaceful and stress free destination to relax and unwind. We hope you will enjoy it as much as we do. We had looked at several homes in nearby towns of the Blue Ridge Mountains and this actually was the very last property on our list. Once we stepped on the porches and walked to the back of the cabin , we just stood and admired the beautiful views of the river and mountains. We knew this was the one for us. We love the privacy of the cabin , but also the security of being in a gated community. We also chose this area because our travel time from home is less than 5 hrs. Our cabin is the perfect private getaway to unwind and relax and to just take in the beautiful views. It is also located in close proximity to several nearby towns and attractions for those who would like to get away for the day. There are canoe & tube rentals nearby. state parks to visit, winery tours , historic sites, quaint shops to browse in, Ashe County Cheese Factory and store in West Jefferson, farmers markets nearby, and many other attractions. Easy access to New River for kayaking, Canoeing, tubing or for just relaxing. There are two spacious covered porches for relaxing and enjoying the river and mountain view. spacious wrap around decks , furnished with rocking chairs and outdoor furniture for relaxing, covered decks to enjoy rain or shine. We also have an outdoor firepit for roasting marshmallows. Awesome mountain cabin with amenities and a great view! Would definitely recommend! Beautiful house with two large decks to take in the amazing views. Very clean and well kept. Mary and Roger were great to work with. Always prompt to respond and provided helpful information that made our trip stress free. Looking forward to taking another trip soon! We are so glad you and your guest enjoyed your time at the cabin. Thank you for the nice comments , it is our pleasure to have such nice guest enjoy our home. We hope you will be able to return again soon! This was our first stay in this wonderful home! The cabin was well appointed and the furnishing were very comfortable. Our hosts, Mary and Roger, were very gracious. The view from the porches over looking the mountains and New River were spectacular! We plan to make this a regular mountain retreat. We thought it was perfect! Thank you for the nice comments about your visit to the cabin. It is always our pleasure to have such wonderful guests spend time in our home ! We hope you can return again soon!! Went for a week with friends at the end of October to see autumn leaf colors. The leaves were a disappointment, but not the cabin. New, well furnished, and very comfortable! Plenty of room for the six of us and still very cozy. Great decks...almost disappointed it was too cool to use them. Area was very quiet and a few interesting and quaint towns and parks about 30 minutes away. Thank you for the nice comments about the cabin! It is such a pleasure to have wonderful guests enjoy time at our home! Hope you all go visit again soon!! We only got to stay there one night as my best friend and I were riding motorcycles through the Blue Ridge Mountains and Roger and Mary graciously allowed us to do a super short term rental. The road in was narrow and curvy but easy to navigate. Once in the gated neighborhood you will see that the homes are all well maintained and the grounds are beautiful. As we arrived to the house our families had already gotten there and had our cold drinks ready for us. The house is stunning with tons of wood and a stone fireplace is the focal point of the main den. The kitchen is really nice and well appointed. Can't say a bad thing about this home and we will certainly be returning when we can spend some more time there to explore the area. Thank you for the nice comments about the cabin. We always enjoy having wonderful guests stay in our home. Hope you and your family can return again when you can stay longer. Thank you for the wonderful compliments you shared about staying at the cabin! It is a pleasure to have such nice and pleasant guests share time in our home, this is why we both decided to list our home as a vacation rental. We love for others to enjoy the relaxation and beautiful view of the mountains and river. We hope you and your family can return for another visit in the near future! We had a great time for a girlfriends getaway at the cabin. The cabin is very clean and the views are amazing. Be prepared that you may not have cell phone service if you don't have Verizon. My friend with Verizon was the only one who could get a signal. It was nice to unplug and relax! The cabin is very well taken care of. I'd definitely stay again. Glad you and your friends had a nice relaxing visit at the cabin! Always our pleasure to have such nice guests enjoy time in our home. Sorry about not having cell phone service. We have noticed some cell phone carriers may not have a good signal in that location. Our phone service is with US Cellular and have not experienced any problems.